Slime STEM Activities - Learning with slime, STEM and fun! 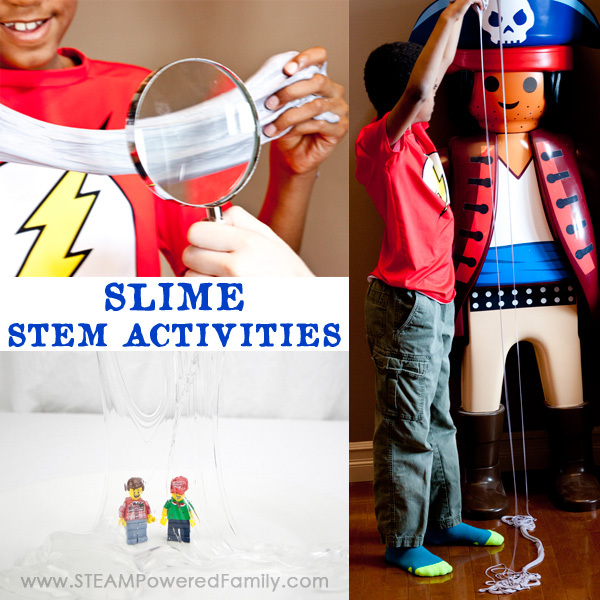 Slime STEM Activities – Learning with slime, STEM and fun! Now that we have the ability to make slime, I feel like w hole new world has opened up to us! 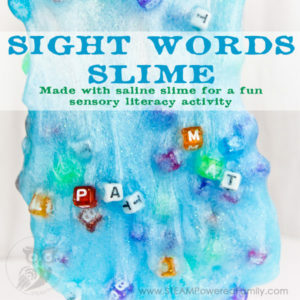 Slime is a fantastic tool for sensory play, as part of an anti-anxiety kit, and to develop fine motor strength. In my experience, it also gets my kids up and moving! Perfect for playing indoors on a cold, winter day. 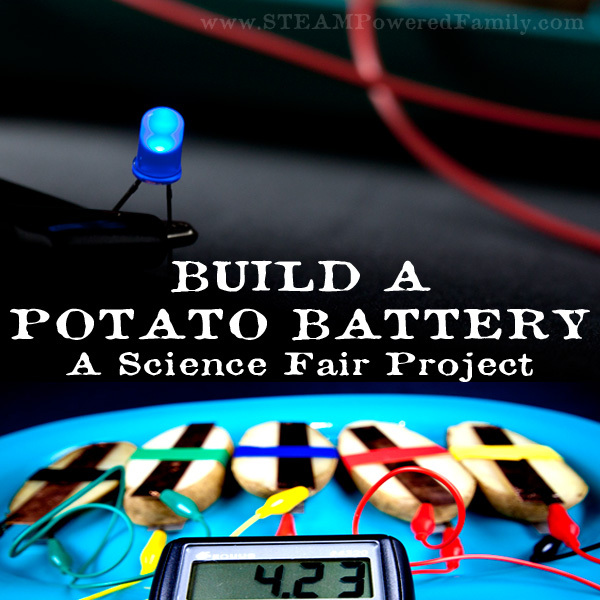 It can also be used in a lot of amazing slime STEM activities! 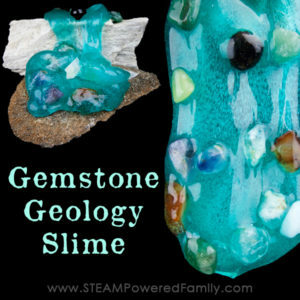 Not sure how slime and STEM go together? Read on! 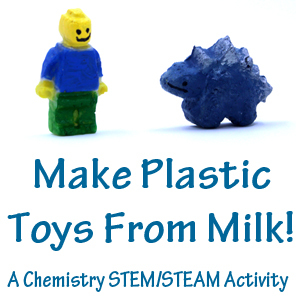 One of the questions I received after posting my slime recipe, was about how slime can be considered a STEM activity. What a great question! 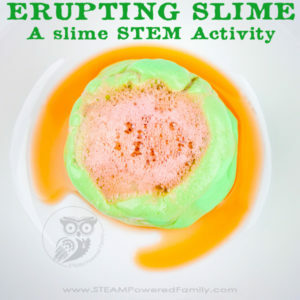 I started to answer her but realized that my comment was becoming a post, so I wrote a post on Slime STEM Activities! 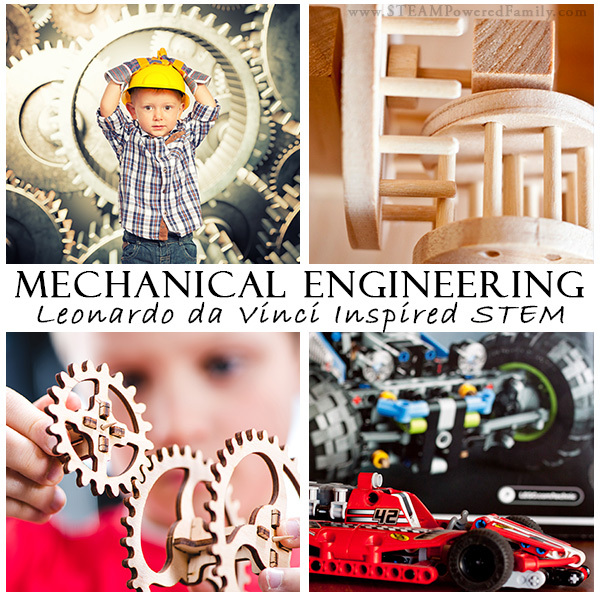 First up, if you haven’t read about how I believe almost any topic can be turned into a STEM Activity, take a peek at the many articles and resources I have available here in my Guide to STEM Activities. Like any scientific activity, safety needs to be the first priority. There have been reports of some people using unsafe ingredients and suffering allergic reactions to slime. Please, be safe. 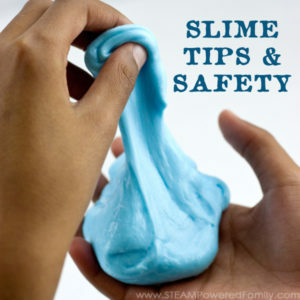 For more details on how to make and use slime safely see this article. Obviously slime is a fantastic science experiment exploring polymers and non-Newtonian fluids. Something we LOVE around here. In the past we’ve done lots of experiments on polymers and non-Newtonian fluids, but the one thing that was missing from our activities was creating slime. Now that we have the ability to make slime, we can do some side-by-side investigations comparing the properties of various polymers and non-Newtonian fluids. Here are some other polymer experiments, fantastic for doing side by side comparisons between the results of the various chemical reactions. As part of our exploration with slime we have also spent a lot of time doing scientific investigations into recipe variations. When we created our clear slime, this was an excellent example of trying a variety of approaches in our slime creation to see how it altered the result. 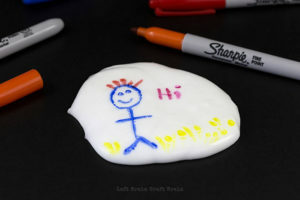 Certain techniques create an extremely stretchy slime, others create a slime that is prone to breaking. 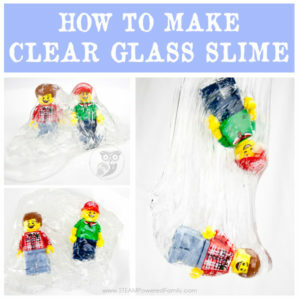 Or in the case of our clear slime, some resulted in very cloudy slime, while others had more clarity. Altering ingredients, quantities, and ratios also affected our results. Through all of this experimentation we’ve practiced a lot of math, measuring, unit conversions, plus doing research, developing hypothesis and procedures, then altering those procedures. Unintentionally, we have spent a lot of time and focus applying scientific procedures and principles. 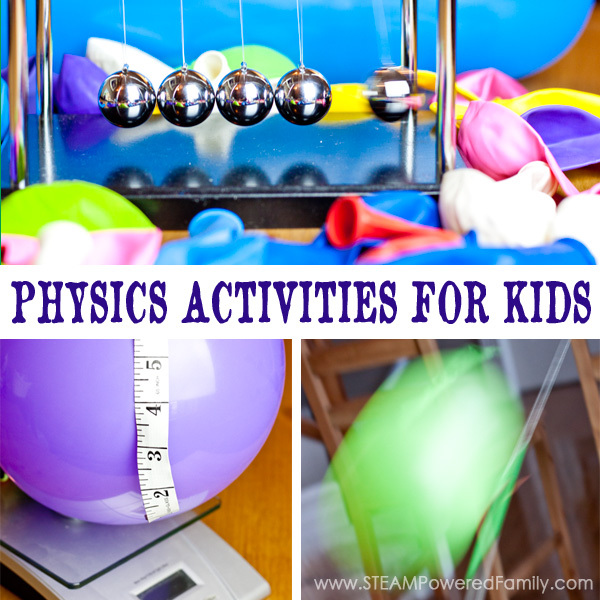 With the children repeatedly applying these processes, they are becoming very comfortable and confident in how to do their research and experiments. Inquiry learning at it’s best, and all inspired by a love of slime. Another fantastic activity to do with slime, and is part of our scientific investigations, is testing the properties of our slimes. This has involved measuring how far we can stretch it before it breaks. Or holding it up and letting it stretch and pool on the floor, until it breaks and using a stop watch to time how long it takes until it hits breaking point. Test the stickiness by seeing how many items can be picked up with our slimes. We then tested the effect of incorporating objects in our slime to see how it altered the results of our stretch/break tests. We even broke out the magnifying glass to see slime up close. This was especially interesting when looking at the bubbles in our clear slimes. 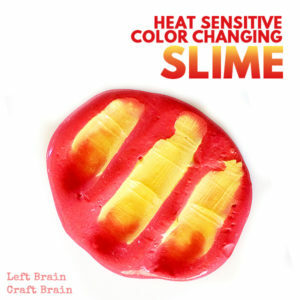 When we first started trying to make slime I desperately wanted to try my hand at heat sensitive slime. It looked amazing and as a kid that grew up with “mood putty” that would change color in my hands, this was a great throw back to my youth. Finally, we were able to make our own mood slime! However, it turns out our pigment changes color at high temperatures and not lower temperatures like the pigment available in the USA. The pigment was also VERY hard to find in Canada. Overall we still had fun, but it was not the result we were hoping for. 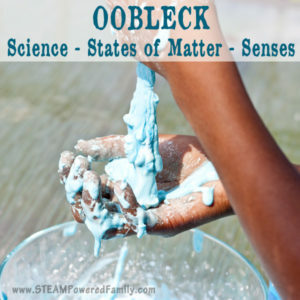 If you are in a place were you can purchase the proper pigment, this is a must try slime activity! Another activity we created that was a HUGE success was our Erupting Slime. Since our saline recipe calls for baking soda, we had the idea of upping the baking soda to see if we could make it erupt. We had fantastic success, plus it became a wonderful lesson in erosion. Something we didn’t expect, but was a pleasant surprise. One of the slime STEM activities I’ve been wanting to try for a long time is magnetic slime and we finally did it! We made one inspired by that awesome scene in Harry Potter that was all about Troll Bogeys. So cool!!! Magnetism and slime science? Win! My youngest is just learning to read, but getting him to sit and practice sight words is such a challenge. Then one day when I saw him happily sitting and playing with slime I knew I had a great opportunity. With the addition of a few letter beads we created our sight words slime. Not only did he have fun playing with it, but my fully literate oldest son thought it was a fantastic game and joined in the fun. Another slime STEM activity we love doing is creating slime art. It’s such a fun way of doing STEAM and always results in lots of giggles. A wonderful rainy day activity. In the past I often built sensory bins as part of our unit studies, but recently we changed things up a bit and made a gemstone slime filled with rocks and crystals. It turned out stunning and it has become a favorite of everyone. 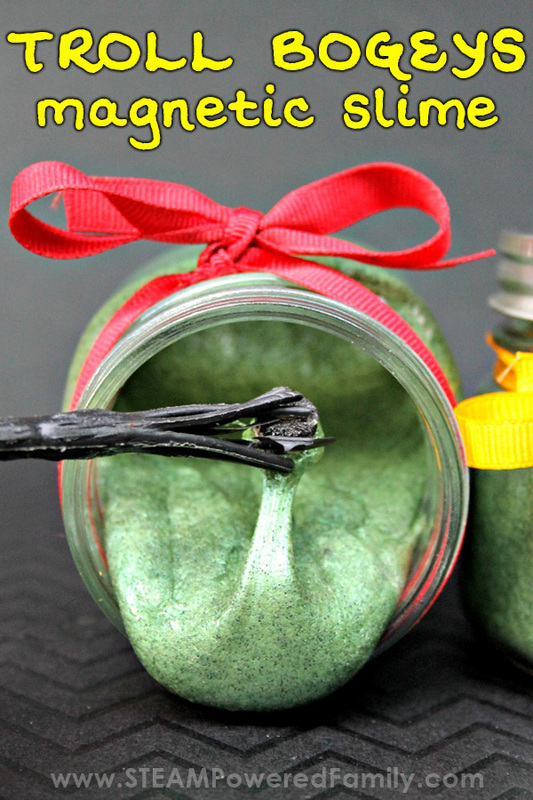 Get creative and use slime as a sensory addition to a unit study. The results may surprise you. One of the slime stem projects we tried unsuccessfully was creating an edible slime (I cemented my fingers together! It was a crazy fail!). If you want to give it a try here are a couple of places you can get tips: Sugar, Spice & Glitter and Crafty Girls. 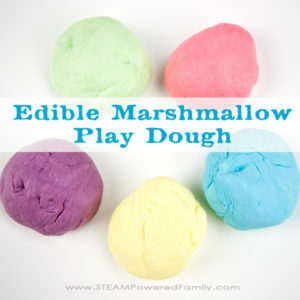 However, we did have a big success come out of our edible slime experiments, instead we created an edible marshmallow play dough. Although it didn’t have the stretchiness we love in our slime, we did end up with a play dough that smelled amazing and tasted pretty good too. When our first batch of slime came together we literally danced around our kitchen. It came on the heels of 2 years of failed attempts. Little did I know that our success was going to lead to many hours of hands on learning, exploration and slime STEM activities. It’s been a wild journey in our education plans this year, I never thought slime would have us digging into our science and STEM studies so deeply!